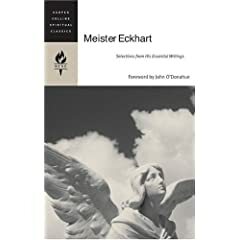 Eckhart von Hochheim--more commonly known now as Meister Eckhart --was unusual for his time but this isn't apparent from his childhood or his education. He was born in Germany in the year 1260. His family was wealthy and considered to be of "noble" blood. Yet, we know very little else about his family. He attended the University of Paris and was raised as a Christian. After receiving some of his extensive education he joined the Dominican Order and committed himself to a life of preaching and teaching. He continued to study and receive academic validation and support from his brothers and sisters in the Faith. Eventually, he was named as a lecturer and teacher of theology in more than one institution. As far as this goes, it seems that he was absolutely typical for an educated man with an affluent background in the 13th and 14th centuries. But, as his name got around and more people were exposed to what he had to say, the commentary became focused on how unusual his sermons were. Though he wrote in the ecclesial Latin of the day when functioning as a minister, he preached in the native German language of the people. He was unafraid to use their dialect and their words to make his preaching especially relevant to his audience. By casting his words in familiar tones and phrases, he was able to pierce through the silent indifference of many in his audiences. As for the subject of his sermons he seemed to be almost specifically concerned with one particular topic. He wrote, "When I preach, I usually speak of detachment and say that a man should be empty of self and all things; and secondly, that he should be reconstructed in the simple good that God is..." This kind of mystical theology made some of his contemporaries nervous. It was a turbulent time in the life of the Church with the Pope living in France and the continued skirmishes between the Dominicans and Franciscans.So, when his preaching stood out it gathered attention from people who were already on edge and looking for heretics and schismatists. Eckhart once wrote that "if the only prayer you ever prayed was 'thank you,' it would suffice." This upset people who stood to gain by dictating prayers and processes for encountering God. To boil Faith down to gratitude was unacceptable for Eckhart's opponents. He is reported as insisting: "All God wants of man is a peaceful heart." For those who wanted more than simply peaceful hearts, this was outright heresy even if they wouldn't take the time to consider what Eckhart really meant. He once advised people to "Do exactly what you would do if you felt most secure" because of the power of God's grace and mercy but this made those in power--and those who had bought into the idea of earning grace--uncomfortably. He further drew his opponents' wrath with his contention: "The only thing that burns in Hell is the part of you that won't let go of your life." Eventually, he was accused of heresy and no matter how many people continued to vouch for him he eventually had to face his accusers. They accused him of heresy and he denied it but finally he agreed to make a conditional statement that disproves all allegations of heresy. He insisted that he didn't think he was wrong but that if he was then he enthusiastically renounced anything he might have erred on in speech or written word. This open and eager admission means that he was not a heretic even if he erred because heresy is an act of the will and not the intellect. He had only about a month after his trial to continue in ministry before dying but he did so as a teacher and preacher of unusual truths in unusual ways. He died secure in the grace that had been given to him by God and died preaching unusual grace to a people trained not to believe it.